Pali Campion srl signed an important agreement for the sole distribution for marketing and selling HIGHSTEP system to be used on steel monotubular columns and high masts. It is an original innovative, certified and patented product as alternative to the standard climbing ladders, which involves considerable advantages as far as the safety is concerned. This revolutionary climbing system, has been developed by a Swiss businessman who, understood the inefficiency and the dangerousness of the current climbing systems, after a serious fall from a ladder. In the XIX century the railway revolutionized the way of transport for people and good. 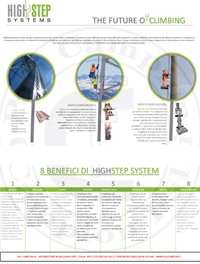 Will HighStep system have the same prospective for access to high places? HighStep consists of two different components, the aluminum rail as carriage system and at least, one climbing system which can be selected.